We help our customers become viable by providing them with effective support systems that allow them to focus on their core business. SoftOne specializes in ERP and HR software, and is today the leading supplier in the Nordic countries to those working with electrical engineering, plumbing and constructions, and trade. Our customers also include hotels and restaurants, accounting firms, and manufacturing and service production companies. We develop our systems ourselves, and provide our customers with support, consultant services, and outsourcing of payroll. We offer a modular cloud-based solution, which allows our customers to use our complete solution or individual modules. Our 2600 contract customers have been with us on average for 12 years, and when surveyed, have been among the most satisfied customers in the Nordic countries. SoftOne was founded in 1985 by Håkan Lord, who still owns and operates the company. Our 60 employees can be found in our offices in Stockholm, Göteborg, Helsinki and Oslo. 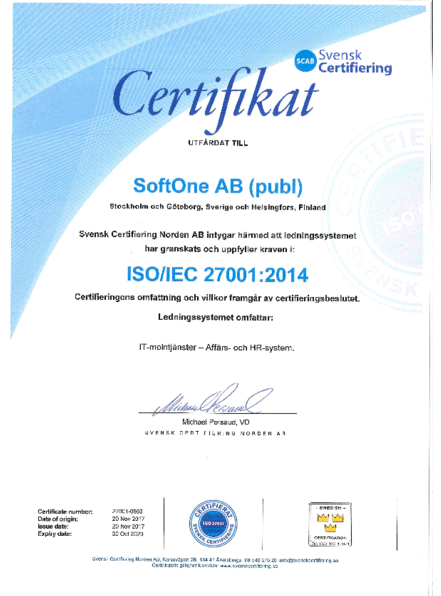 SoftOne är sedan 2017 certifierade inom ISO 27001, av många sett som den mest krävande standarden inom ISO-familjen. Our vision is to become the leading Nordic provider of business-critical systems for small and medium companies and organizations. Our mission is to help our customers become viable by providing them with effective support systems that allow them to focus on their core business. Our 2600 contract customers have been with us on average for more than 13 years, and when surveyed, have been among the most satisfied customers in the Nordic countries.